Bronx Borough President Ruben Diaz Jr. is in favor of closing the jails on Rikers Island but vehemently opposed to the joint de Blasio administration-City Council plan for a new jail site in the Bronx. Diaz Jr. isn’t against a new jail in his borough. Instead, he wants the city to use a different location, closer to the courthouse where defendants must appear, but that city officials say is less workable than their chosen site. During the interview, Diaz Jr. also addressed admissions to the city’s specialized high schools and several other topics, while also giving, when asked, an early version of his 2021 mayoral pitch to voters. 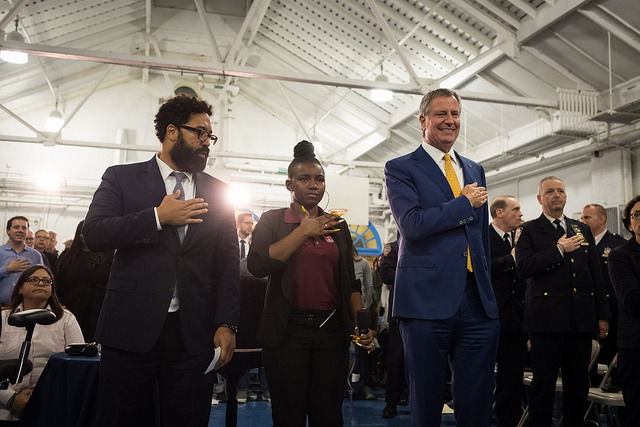 Diaz Jr. has said he plans to run for mayor in the next election, when Mayor Bill de Blasio’s administration ends due to term-limits––part of what is likely to be a fairly crowded field of Democrats. The city’s current plan to shutter Rikers Island jails includes building a new jail on an empty NYPD tow pound in Port Morris, a neighborhood in the South Bronx, but Diaz Jr. protests the lack of input from Bronx residents when the city decided on the plan. He said residents of Kew Gardens in Queens and Chinatown in Manhattan, where other jails are planned, have also protested the lack of community input. In both Brooklyn and Manhattan currently used jails will expand under the city’s plan. As an alternative to the tow pound, Diaz Jr. pointed to lots on 161st Street in the Bronx, where the Bronx Supreme Court and family court are located. Criminal justice reformers advocate for close proximity between jails and courthouses and public transportation, which can alleviate detention time and ease access for families and defense attorneys. This level of access has posed a challenge on Rikers Island, which is considerably difficult to reach. In response to Diaz Jr.’s plan, a de Blasio spokesperson said that a jail demands more space than is available on 161st Street, including some owned by the state. “What data do they have? They haven’t even examined the site,” Diaz Jr. countered. “Some of that space belongs to the state––and maybe they don’t want to get into it with the governor, because the mayor and the governor don’t get along,” he said, referring to the notoriously contentious relationship between Governor Andrew Cuomo and Mayor Bill de Blasio. But, Diaz Jr. said he already secured a commitment from the state -- he’s close with Governor Andrew Cuomo -- to relinquish the state property at his preferred site. As conversation switched gears to the broader role of a borough president, Diaz Jr. said his team was putting forth recommendations to bolster the office’s legislative, voting, and budgetary power to the 2019 Charter Revision Commission, particularly concerning land use. His comments came two days after the charter revision commission’s final “expert” hearing, which focused on the role of borough presidents, during which several experts agreed that a revised charter should strengthen borough presidents’ legislative authority (some of the panel’s experts were former borough presidents themselves) but not make drastic changes to the limited powers of the position. Diaz Jr. said he and his appointee to the commission, James Vacca, a former City Council Member from the Bronx, are still brainstorming proposals, but promised to publicize suggested reforms once they have formalized them. During the commission hearing on borough president powers, Vacca did not pose any questions to the expert panels about the position. Time is running thin for Diaz Jr. to make his recommendations and preferences for charter reform known. The hosts also asked Diaz Jr. about one of the other hot recent political issues, that of standardized testing for the city’s highly-segregated specialized public schools, two of which are located in the Bronx. Currently, admission to eight of the nine specialized schools is based on a single test: the SHSAT (Laguardia High School is a specialized performing arts school). 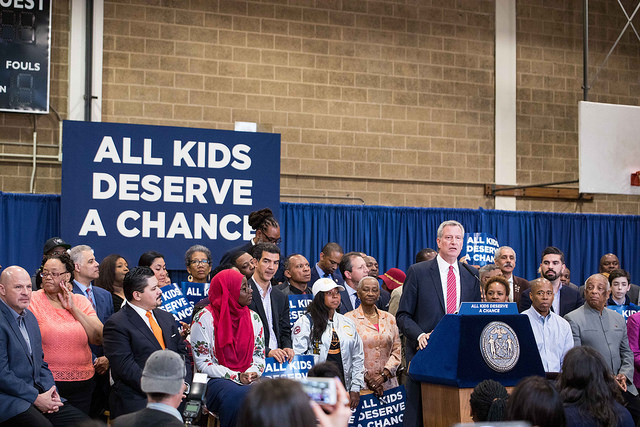 Mayor de Blasio is seeking to scrap the test and move to multi-measures and a system whereby the top 7% of each middle school graduating class has a seat at a specialized school, but received significant blowback from the city’s Asian-American community, which is significantly overrepresented in the schools relative to broader city population, while black and Hispanic communities are severely underrepresented. “I agree that the status quo is not working. When you have slightly less than 11 percent of all seats at the eight specialized high schools offered to black and Latino students this year, there’s something fundamentally wrong with what we’re doing,” said Diaz Jr. He suggested a more holistic admissions process, akin to Ivy League universities, that considers students’ GPA and extracurricular activities. “We should not be putting one community against the other. And this is where I disagree with the mayor and his rollout,” Diaz Jr. said. Last summer, when de Blasio announced his plan, Diaz Jr. released a statement calling it a “welcome step forward for fairness and equity in the public education system.” He has since changed his tune. “What we need is to increase the amount of seats,” he said on Max & Murphy. “Only three of the high schools are codified by state law. The other five were created and we need to just create more if we have to.” He also called for more access to gifted and talented programs for students in every community. Diaz Jr. also discussed the Jerome Avenue rezoning in the Bronx. The project, launched last March, promised to create new retail opportunities and thousands of new affordable housing units while protecting the tenants who were already there along the way, and making investments in the surrounding community as new population density was welcomed in. Lastly, in light of Diaz Jr.’s less than covert plans to run for mayor, he spoke about his vision for New York City, when asked for his initial pitch to voters ahead of the 2021 election, which is expected to feature Brooklyn Borough President Eric Adams, Comptroller Scott Stringer, City Council Speaker Corey Johnson, Diaz Jr., and perhaps others. 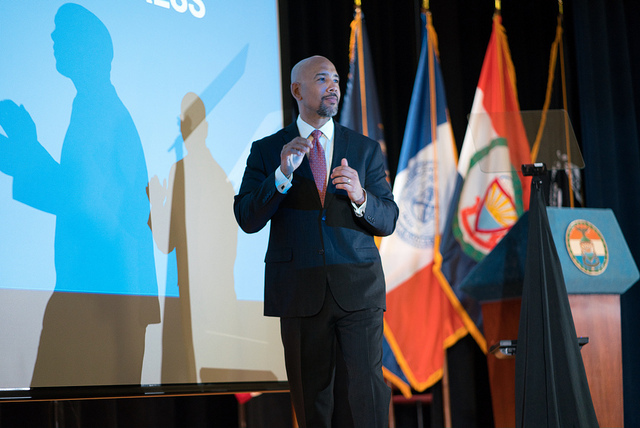 Earlier this month, Diaz Jr. released his 2018 Bronx Annual Development Report, boasting high levels of investment and development in the borough, which he highlighted during his ninth State of the Borough address. In June, Mayor de Blasio announced support for a bill in Albany to gut the test. In the interim, the city called for revamping Discovery, telling the public: “Based on modeling of current offer patterns, an estimated 16 percent of offers would go to black and Latino students, compared to 9 percent currently.” The increase would be the result of limiting eligibility to Discovery to children attending a subset of the city’s middle schools having at least a 60 percent Economic Need Index calculated based on the neighborhood’s poverty level. While the changes prevent many poor children of all races and ethnicities from being eligible for Discovery, a recently-filed lawsuit contends the changes are unconstitutional because in changing the way the city structured its Discovery program revamp – by limiting eligibility to the middle schools with at least 60 percent of the students living in poverty – the city disproportionately excludes poor Asian children at ineligible schools. Joshua Wallack, a Deputy Schools Chancellor who is the DOE’s point person leading this effort, recently submitted an affidavit under oath to the court explaining that the DOE cannot say what impact the change will have on increasing black and Latino enrollment. He explained that “there are several factors beyond DOE’s control” that will affect the racial and ethnic composition of the students admitted through a changed Discovery program. He also conceded the switch to only high-poverty schools may not improve diversity at the specialized high schools because Asian-American families are statistically the poorest demographic group in the city. He noted that last year 70 percent of students admitted from these high-poverty schools were Asian-American. On one level, the Brooklyn Tech Alumni Foundation hopes the city’s Discovery changes do result in increased enrollment of children from underrepresented communities. That is why we have urged the city to change the Discovery program to take into account children who are educationally disadvantaged by expanding eligibility without regard to qualifying for free lunch for children attending schools that currently send few if any students to specialized schools; because of segregated housing patterns this change would likely increase the number of black and Latino students qualifying for Discovery without penalizing poor students of all races who are being excluded because of the change. But on another level, we are appalled that the DOE would initiate significant changes without adequate review and study. The city’s modeling was based on only looking at one year of data, which can undermine its accuracy. There should be more than “optics” in play when it comes to disrupting a system that is producing the highest-achieving high schools in the city. This is not the first time that the DOE has misled the public on this topic. While the DOE claims replacing the SHSAT with a range of more subjective metrics will have no impact on student preparation for the college-level coursework required in specialized schools beginning in the ninth grade, the New York City Independent Budget Office just released a report showing that 500 students scoring below grade level on the state’s math assessment would likely be admitted to the specialized high schools under the mayor’s proposed changes. The DOE’s hostility to the SHSAT knows no limits and apparently drives officials to suppress the truth whenever it is inconvenient to their view. This year saw the forced release of the DOE’s study done five years ago proving that the SHSAT was both a reliable and valid predictor of student performance at the high schools. No explanation has been offered for why they suppressed this information and kept it from the public. But the major inconvenient truth the DOE continues to ignore is that demographic results of the SHSAT directly reflect the inadequate advanced academic programming (especially in so-called STEM subjects like science and math) it provides to most children in underrepresented communities. When that advanced programming was offered in middle schools in every district, demographics at specialized schools more closely mirrored the city at large. Once the city systematically eliminated those programs in black and Latino neighborhoods, those students were denied tools to let them succeed on the test and in the schools. We know students from all communities can succeed on the SHSAT and in the schools when given the tools, since they did in the past. If the DOE would do the hard work of restoring Gifted and Talented and enhanced and accelerated coursework in every community, we could close the demographic gap at the specialized schools. When government denies the truth and makes public policy on false assumptions, we get the worst of both worlds: effective change does not take place, and additional harm can result. It’s time for the DOE to face the truth and start doing something about the real problem. School system leaders can start by going to our Save the SHSAT website, where we have laid out just such a plan. Larry Cary, a Manhattan lawyer, is the President of the Brooklyn Tech Alumni Foundation. When I graduated from Stuyvesant High School in June of 2001, I remember feeling sad to be moving on from my friends and excited to be moving on to college. But I also remember an overwhelming sense of relief that I would no longer have to deal with the tests that formed the backbone of the Stuyvesant High School experience. The tests didn’t start at the end of the first semester or even during midterms freshman year. They did not even start on the day that I made the trip down to Battery Park to take the “Stuy test.” Rather, they started toward the end of middle school, spending Saturday mornings in a hotel conference room in midtown Manhattan, taking a prep course run by a Stuyvesant math teacher (who, when I was a sophomore, would give me the lowest grade of my high school career). I remember that many of us wore our soccer uniforms and cleats to class because we had to hurry off to games immediately afterwards. By this time I had been subjected to plenty of high-stakes exams: pre-school interviews, citywide exams, a fifth grade full of tests and interviews to get into well-regarded public middle schools, and, even after I had started attending one such school, the Hunter test, on which I did not come remotely close to earning the admission score. I understood some of those tests to be more important than others, but none carried the weight of the ones related to Stuyvesant. The implication, starting with preparations for the SHSAT, and continuing at a pace of six or more exams per semester during my time at Stuyvesant and additionally highlighted by the SAT, was that how I performed on each exam was going to impact the rest of my life. My parents did not pressure me to get into Stuyvesant or seem to care about where I went to college (though it was always understood I would go). They did pressure me to do the homework the prep course assigned, and I recall that I did it. I scored a 560 on the exam -- the cutoff was 559 -- and was excited to be accepted as, technically speaking, the dumbest kid in school. I called a close friend who told me he had missed getting in by one question. He would be going to Bronx Science. Even though we only lived a few blocks away from each other, we drifted apart after that. The pressure was entirely driven by the culture surrounding Stuyvesant. Other than the occasional creative writing course or class led by an outside-the-box thinking history teacher, Stuyvesant was all about tests. The midterms and finals were inflexible and merciless. Scantrons were everywhere. “What did you get on the test?” was a frequent question, one that had to be asked with a level of tact that high school kids are seldom capable of. Even though I was, relative to my classmates, an unmotivated, average student, content to get Bs and take “remedial” Spanish and math (which at Stuyvesant meant taking ninth-grade Spanish as a ninth-grader and not taking calculus), I would sometimes wake up in the middle of the night and scribble math equations on a piece of paper next to my bed. At my mom’s advice, I took to sleeping with textbooks underneath my pillow the night before tests, hoping to learn just a little more through osmosis. At the end of one semester there was a rash of episodes involving fire alarms getting pulled and the school being unnecessarily evacuated. It was rumored that they caught the culprit by identifying a single student who had an exam scheduled on each of the days an evacuation occurred. Students whispered that we could not access the patio outside the fifth floor cafeteria because the administration was afraid if we were allowed on it there would be suicides. It was said we were not given class rankings for the same reason. Exams aside, there was a lot of fun to be had at Stuy. I wrote for the sports section of the school newspaper. A review of the yearbook tells me there were more than 90 clubs, including something called “The Real,” devoted to “underground hip-hop music,” that I was the president of -- it is my recollection that we had no budget or formal meetings. I played backup tight end on the football team, which I am not sure I could have done at another school. Significantly, in my experience the football team was one of the few places at Stuyvesant where Asian, black, Hispanic, and white students really spent time together (the cheerleading team was a similarly integrated group). I can still remember all the different parts of the school where students of particular races congregated almost exclusively and I suspect that my classmates can as well. On the second floor where the main entrance and exit was located, there was a “senior bar” -- basically a waist-high counter surrounded by lockers -- that at the time I would have said was the epicenter of the social life of the school but I now realize was overwhelmingly white. There was another “bar” that was widely referred to as the “Asian bar” on the sixth floor. I recall that there was an area behind the escalators on the fifth floor where African-American students hung out. The exact demographic makeup of the school at the time is difficult to find online, but as I recall, Asian students made up about half the school, with white students making up most of the other half. As now, the percentage of black and Hispanic students was well below 10%. I am sure that Stuyvesant has changed in many ways since I left, but in some important ones, it has not. Like most alums, it is through my perspective from and since my time at Stuyvesant that I view the ongoing debate about how -- and whether -- specialized high school admissions should be reformed. Stuyvesant needs to be more diverse and it is not entirely clear how best to make that happen. What I find missing from the debate is a discussion about how the “Stuy test” and the Stuyvesant experience are linked. If students are not going to be admitted based on their ability to excel on a single, high-pressure exam, they should not be evaluated primarily based on high-pressure exams. 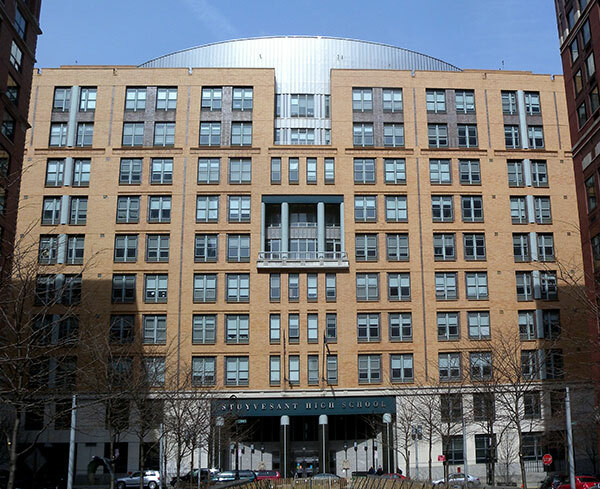 It seems likely that a student body admitted to Stuyvesant based on criteria other than the SHSAT would benefit from a reduced emphasis on testing. It may even be that all students, including current Stuyvesant students, would benefit from a reduced emphasis on testing. At the same time, the iteration of Stuyvesant I attended left me very well prepared for college and law school. I feel strongly that I was always going to be an average student in high school. At an underperforming school, that might mean barely graduating. At Stuyvesant, that meant a B average and a partial scholarship to Lehigh University. Many New York City students would benefit from the education I received, regardless of how they are admitted to the school or how painful it might be while they are there. Jonathan Fishner is a graduate of Stuyvesant High School, class of 2001, and an attorney. His opinions are his own. Critics of the test used for admitting students to New York City’s specialized high schools -- Brooklyn Tech, Stuyvesant, Bronx Science, and five others -- failed to properly assess this year’s test and admission results because they yearned for a more robust increase in offers to black and Latino students, when compared to the year before. The city had improved the test and increased outreach and free test prep, all efforts intended to redress their underrepresentation, but in a school system where more than 70 percent of students are from black and Latino families, just 10 percent of the seats in the specialized high schools were offered to students from those communities. This disparity is unacceptable. But so too is a failure to properly analyze the test and admission results, and thereby call the city’s efforts a total failure and demand simply that the test be eliminated in one way or the other. Such an approach overlooks what is and can be done to help remedy the city’s decades of neglect in many of the schools serving black and Latino communities. While a sudden turnaround was not to be expected, this year’s test results did show that as a percentage of all offers, there was a small increase in offers made to black students. In absolute terms, 207 black students received offers compared to 194 the year before. On the other hand, Latino admissions declined by 10, to 320 from the latest test. Because both white and Asian offers of enrollment declined this year, both absolutely and as a percentage of total offers made, it could be argued that these results potentially show an inflection point for black admissions. However, since the students self-identifying as “multi-racial” nearly doubled, to 128, and because the race of 419 others is unknown, it would be premature to make such a claim. Also ignored by critics of the test, was any appreciation of the city’s contradictory efforts. On the one hand, it increased free test prep. On the other, it changed the test, making it harder to prepare. While the Brooklyn Tech Alumni Foundation, which I head, supported changing the test to make it better aligned with what is supposed to be taught in our schools, and thereby mitigate against a test prep advantage, we shouldn’t entirely ignore this issue in our discussion of the latest test’s results. Notably, while 450 more Asian students took the test this year, fewer were admitted this year than last in both absolute and percentage terms. Because the accusation has frequently been made that the test’s results are skewed because so many Asian students do test prep, the city’s effort to mitigate test prep advantages may well have worked. Since the city is again changing the test to be administered later this year, by, for example, including poetry, a fair and proper assessment of the city’s efforts may take a few more years. Other efforts can and should be made. One step the city could take is to revamp the Discovery Program – a long-standing, if unused, program which lets “disadvantaged” students who fall just short of the test’s cut-off score get a second chance for admission. By a targeted redefinition of what “disadvantaged” means, focusing on the underrepresented schools and communities, more high-performing black and Latino students will have increased chances for success. Another effort that should be adopted is the bill in Albany sponsored by Bronx State Senator Jamaal Bailey, a Bronx Science graduate, that mandates administration of a free and voluntary practice SHSAT, the specialized high school test, to be offered in sixth grade, with students receiving an analysis of test results to identify areas in need of improvement before the test is given in eighth grade. We give a PSAT for obvious reasons, why not a PSHSAT? Alumni from all eight test-in schools believe deeply in increasing diversity at their schools, but believe just as deeply in keeping the test as the single criterion for admissions as an objective measure immune to the kinds of influence many more affluent white families use to gain entry for their children to better schools that use the kind of subjective criteria that Mayor de Blasio and others have said should replace the test. For example, the student body of Brooklyn Tech, which sits in the middle of Brownstone Brooklyn, is 80 percent students of color. The decades of declining enrollment in specialized high schools experienced by the black and Latino communities correlates with the elimination of enriched educational programs at many of the elementary and middle schools in these communities. Today only 15 middle schools account for over half of the students in the specialized high schools; none are in black or Latino communities. A fair assessment of the city’s efforts simply cannot ignore the impact of decades of neglect by the Board of Education and its successor, the Department of Education. Ultimately, the city needs a plan to promote the creation of pipeline middle schools located within the black and Latino communities of our city. This requires the creation of vibrant gifted and talented programs in the elementary schools and enriched coursework in the middle schools. The new chancellor would be well-advised to create such a plan. At the same time, efforts to increase outreach, free test prep, reconfiguring the Discovery Program to enroll more disadvantaged students from black and Latino communities, among other measures, can help to promote more diversity at Brooklyn Tech and the other test-in high schools. Such efforts should be fairly and accurately evaluated, not skipped over in a rush to demand elimination of the test. Larry Cary is a Manhattan lawyer and president of the Brooklyn Tech Alumni Foundation. Every October, roughly one-third of the eligible eighth-graders in New York City -- between 25,000 and 30,000 students -- take the Standardized High School Admissions Test (SHSAT) for a chance to attend one of the city’s eight specialized high schools. Admission to these schools is highly competitive, and spots are coveted. While less than 20% of students who take the test receive an offer, 72% of those who are accepted choose to attend. Yet, despite being in New York City, where the overall student body is 72% black and Hispanic, students of color make up only 12% of specialized high school students, a number that is declining. This is due to a flawed and exclusionary education system that negatively affects low-income students and students of color from their first day in the system. In New York City, the clear majority of students are assigned elementary schools that are within their zip codes. For many students of color, this means that they attend schools that face a myriad of problems, including: less funding and resources, less experienced and effective teachers and overcrowded classrooms. This, in addition to the various socio-economic problems that students from these backgrounds already face in their daily lives. Ultimately this results in students from these backgrounds having lower attendance rate, lower grades in key subject areas and lower standardized scores. Next, because entry to middle school is based on those aforementioned metrics, low-income students and students of color are substantially less likely to attend honors or screened programs. Instead, these students attend schools within their zip codes, which face the same issues that elementary schools face. And, analysis shows that between 2005 and 2013, 88 middle schools, 76 of which were honors or screened, were home to 85% of total student offers to SHSAT schools. Demographic data further revealed that students from these schools came from wealthier, and largely white or Asian households. In addition to the socio-economic advantages that students who enroll into these strong middle schools typically have, they also benefit from attending the schools themselves. Not only are these schools better funded, they also offer more comprehensive and rigorous curricula. Importantly, these schools also dedicate resources to informing students and parents about the SHSAT, and the high-school admissions process in general. A natural consequence of attending one of these schools is that students and parents are both more likely to have heard of the SHSAT and students are more likely to be prepared to take the exam. It is here that the inequities in the system become reinforced, adversely impacting students in two key ways: first in deciding to take the SHSAT and subsequently, in earning the requisite admission score. Yet, it would be a mistake to assume that the SHSAT itself is color- or income-blind. Analysis reveals a flawed exam. Like all standardized tests, critics argue that the SHSAT does not test for ability and potential. 1. The SHSAT’s decision to favor higher overall scores, rather than balanced ones. This means that a student with a score of 500 (with a score breakdown of 250/250) is viewed less positively than a student who scores a 501 (with a score breakdown of 399/102) – where the lowest score a student can get on a section is a 100, and the highest a 400. 2. In addition, students who prep generally take several simulated SHSATs under test conditions. Since the SHSAT is administered only once per year, students who receive this preparation are much more prepared, psychologically and otherwise, than those who are taking the exam without having practiced a simulation. Criticisms of the SHSAT are not solely socio-economic. Two reports that examined the SHSAT found that “Students who receive certain versions of the test may be more likely to gain admission than students who receive other versions” and that “the SHSAT ignores widely accepted psychometric standards and practices.” Psychometric standards are evaluations that test for reliability and validity. In addition, because the cut-off scores for admissions differ slightly from year to year, being accepted on the margins is largely a matter of luck. And finally, the SHSAT only tests for ability in math and reading, other key subjects, such as science and social studies, are not included. Ultimately, the SHSAT, and the educational system that it sits within, is deeply flawed. Policy changes must be considered to make the system more equitable. Bernard Agrest is a recent graduate of the University of Edinburgh's MPP with a focus on education policy analysis. 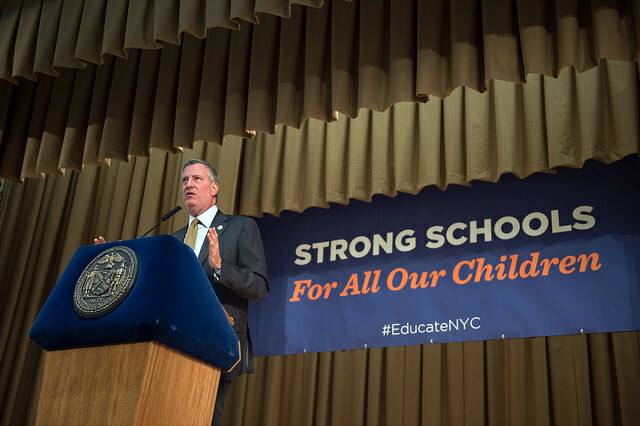 As this school year began last week for over one million students, Mayor Bill de Blasio took advantage of the first day of classes to publicly highlight his efforts to improve the educational offerings of New York City schools. The mayor is now doing so under his banner “Equity and Excellence” agenda. There is a long way to go. Currently, only about 38 percent of the students in our elementary schools are reading at grade level. About 70 percent of students graduate high school. Of those graduating, large numbers are not prepared to do college-level course work -- nearly 80 percent of our high school graduates attending CUNY community colleges must take remedial courses in reading, writing, and math. According to one study, only students lucky enough to get into 34 of the system’s 428 high school programs that report graduation statistics have a decent shot at making it through college successfully. To many, the challenges seem overwhelming. 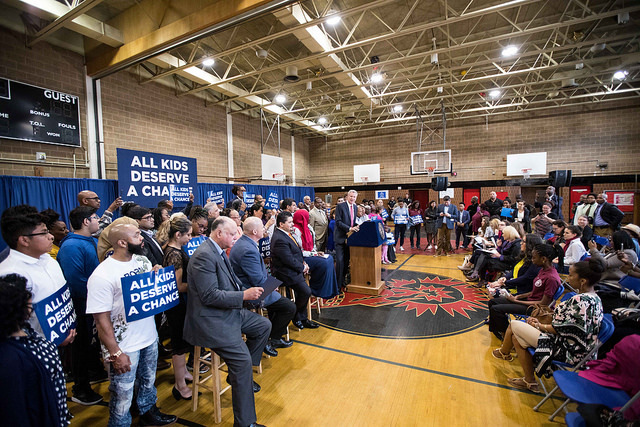 Because of their magnitude, I applaud Mayor de Blasio for recognizing the problems and trying to do something about them by adding pre-kindergarten, expanding course offerings, hiring more guidance counselors, and focusing on reading on grade level by third grade. Unfortunately, instead of recognizing the outstanding performance of schools like Brooklyn Tech, which use a Specialized High School Admissions Test (SHSAT) as the criteria for gaining admission, the mayor also used opening day to bash these test-in schools by repeating debunked mythology about the need for multiple criteria to correct for a test that supposedly limits diversity. Contrary to the mayor, according to NYU’s Research Alliance for New York City Schools, substituting multiple criteria for the test “would not appreciably increase the proportion of Black students admitted and alarmingly several of these alternative criteria would actually decrease the number of Black students offered” admission. The root problem for the demographic outcomes of the test, and the mayor’s initiatives recognize it, is that our school system provides unequal educational opportunities for many of the children in our city’s black and Hispanic communities. Newsweek magazine recently published its annual list of the top high schools in the country doing an outstanding job of educating students from families qualifying for free and subsidized lunch, the criteria used in educational circles for measuring poverty. These schools are not only educationally exemplary – among the top 500 in the nation - but given the poverty levels of their student bodies, they are considered off the charts, so to speak, for producing college-ready graduates as measured by graduation rates and passing scores on Advanced Placement tests. New York City had five of the top ten schools in the nation on Newsweek’s “disadvantaged” list. Of the five, four were test-in high schools, including Brooklyn Tech. Townsend Harris, which uses multiple admissions criteria, was the only other city school making the top ten list. Townsend’s admissions criteria include consideration of the applicant’s middle school grades in English, math, social studies and science; scores on state tests in language arts and math; and middle school attendance and punctuality. According to the Department of Education, black students make up only 5.6 percent of Townsend Harris’ student body. By comparison, black students at Brooklyn Tech are 7.5 percent of the student body. While Townsend is home to 64 black students, Brooklyn Tech educates 417. The Brooklyn Tech Alumni Foundation, which I head, is working with Tech to increase the number of its black, Hispanic, and female students. 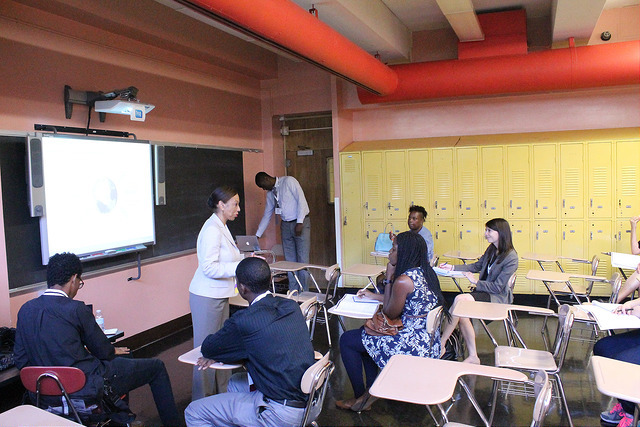 We are in our third year of running a successful pilot STEM (science, technology, math and engineering) Pipeline program which targets underrepresented middle schools in Brooklyn. With the help this year of $250,000 from the New York State Legislature we doubled the number of students in our program. In the past, we have had great success and we hope to do more with this additional funding. 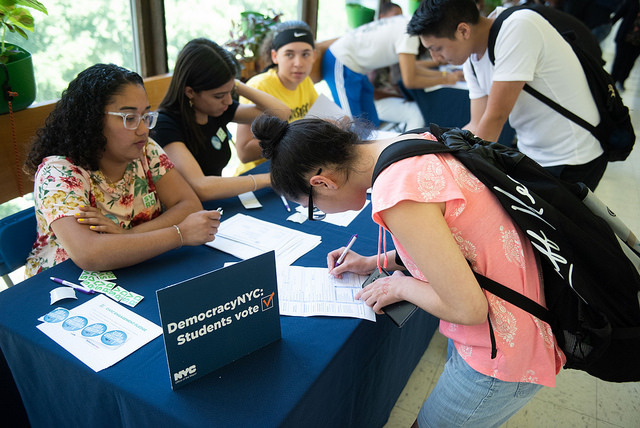 The Legislature also added money to fund programs at the other test-in schools, including Stuyvesant and Bronx Science, to reach out to middle schoolers from underrepresented communities and prepare them to succeed on the SHSAT and to do well at a specialized school once admitted. Our efforts, along with the DOE’s, to improve diversity at the test-in schools are important. But more must still be done. The DOE should revive the Specialized High School Discovery Program, which is moribund at most of the test-in schools but is the legally available alternative mechanism for disadvantaged students to gain admission to these schools. Highly effective for promoting ethnic and racial diversity in the past, economically disadvantaged applicants just missing the cutoff scores took summer classes to demonstrate mastery of skills needed to do the advanced coursework required by these schools. Because poverty rates are now roughly equal among black, Hispanic, and Asian families living in New York City, to be effective a revived Discovery program should also redefine “disadvantaged” to include attending a poorly performing or poorly represented middle school. Because of segregated housing patterns, this would help deal effectively with the educational inequality suffered by too many of the students in our city’s black and Hispanic communities. The city’s school system is not fair. We all know that. But that said, four of the top ten schools in the nation for working class, immigrant, minority and low-income families are test-in schools here in New York City. I applaud Mayor de Blasio and the DOE for continuing to work on improving educational excellence and diversity in our schools, but it does little good to attack a test giving every test-taker an equal and fair shot at gaining admission, especially since elimination of the test as the lone admissions factor would negatively affect diversity at these special schools.